The whole layout of this story held a lot of promise and I willingly immersed myself in Allie's seamy world, eager to see how she handled her manipulative, possibly murderous father as well as the darkly enigmatic Zay. Allie herself is world-weary in a way that mirrors her world, a place ironically sapped of wonder and goodness by the largely unregulated abuse of "magic." I loved the little book she carries around, recording memories against the day they're stripped from her after overstepping herself magically. In fact, each and every character piqued my interest, from Allie's unusual stepmother to her salt of the earth best friend. However, I found that interest flagging fairly soon as the execution did not quite match up to the idea. Zay's and Allie's relationship seemed rather quickly formed. He felt too good to be true while she seemed to fall into a sort of stereotypical urban fantasy composite heroine. I started to lose my sense for what made her unique and felt that they were both smarter than their actions painted them. The tension between them resolved too abruptly for my taste. 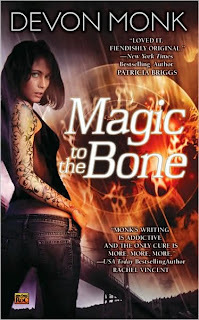 Throughout the story, a well-conceived idea here or a particularly cool plot development there managed to revive my flagging attention, but the follow-through lacked the level of tightness and cohesion that is a defining characteristic of my favorite urban fantasy series's. Have you ever read any of CE Murphy's work? I have literally just put 'Urban Shaman' into my Amazon wishlist as I read one of her short stories a little while ago & loved it! And she even spells it right! ;) I may have to read this one - I don't think I've ever read a book where the main character shared my name! I haven't read any Murphy, Julia. I've almost picked her up a couple times but just haven't yet. I've heard good things, though. Great review, and I echo the recommendation to read "The Walker Papers" series by CE Murphy. Thanks, Hagelrat! I'll hie me to a library.